Danish Design's Self Cooling Mattress is perfect for helping your hot dog to stay cool this Summer. 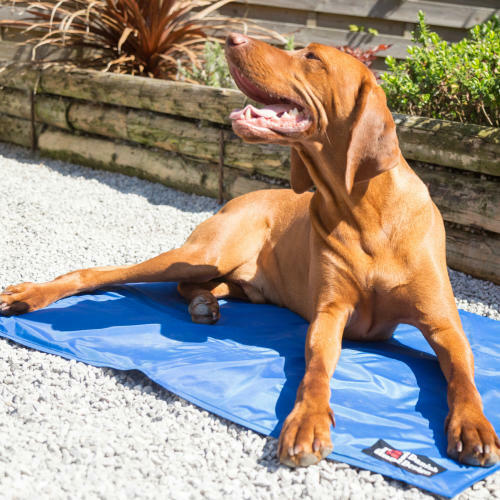 As either a standalone mattress, a topper to your canine companion's favourite bed, or as a travel mat for summer picnics and trips the beach, the mat is filled with a pet friendly non-toxic gel which is cool to the touch to provide instant relief after a sweltering Summer walk. The bed is naturally cooling and doesn't need to be frozen or refrigerated to work - but it is freezer safe and can provide a longer lasting chill out if it is popped in for half an hour or so before use. Made from durable, hard wearing fabric, muddy paw prints can be effortlessly wiped away with a damp cloth.